Ed Miliband has carried out a mini-reshuffle of his top team after Jim Murphy quit the shadow cabinet to run to become leader of Scottish Labour. Mr Murphy has been replaced as shadow international development secretary by transport spokeswoman Mary Creagh. Ms Creagh is succeeded by Michael Dugher, a close ally of Mr Miliband's. 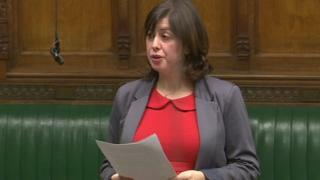 Lucy Powell has been promoted to the shadow cabinet to take on responsibility for day-to-day operations for May's general election. Ms Powell, a former chief of staff to Mr Miliband who became an MP only in 2012, promised to inject some new "energy and vigour" into Labour's campaigning on the ground. She told the BBC she would review the party's campaign machine to ensure it was working "at its very best". "I am going to make sure we put out the very best of our talents and communicate the very strong message that we have got going into the next election and unblock the system so our operation is serving all of those fantastic candidates, our fantastic front bench and our leader," she said. Labour is facing a growing threat from UKIP in some traditional heartlands in the north-west of England. It hung on to the seat of Heywood and Middleton, which is close to Ms Powell's Manchester Central seat, by just 617 votes last month. Ms Powell, who was previously an education spokeswoman, said shadow ministers "need to be more visible and I will enable them to do that" in her role - previously held by Mr Dugher. She added: "I am going to get Ed Miliband out there more because he is a fantastic asset out in the country meeting people directly and talking to people directly, not seeing things through the prism of the media down here [in London], who do not always give him the best ride." The BBC's chief political correspondent Vicki Young said the changes were a reflection that Labour wanted it election campaign machine to run "more smoothly" and portray a more female-friendly image. One recent opinion poll suggested that Labour support had dipped below 30% for the first time since 2010 amid concerns about the party's economic policy and Mr Miliband's leadership.